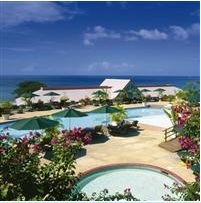 Le Grand Courlan Tobago is an all inclusive resort located at Stone Haven Bay. When you take a flight into Tobago, you will have a 15 to 20 minutes of driving to get to the resort. It is important to note that you won't be able to take the kids with you on your scuba diving adventure since this is an adults only resort. Children under 16 years old are not allowed in Le Grand Courlan Tobago. The air conditioned rooms have a balcony with sea views, roomy bathrooms, in-room safes and some rooms even include a jacuzzi where privacy is assured.